Adopting a designer dog seems to be the order of the day. The ideology driving this trend is the hope of ending up with a hybrid that takes the good traits from both parents minus their shortcomings. Such is the case of the German Shepherd Border Collie Mix. Better known as Shollie, this large designer dog is packed with energy. He is a favorite among many due to his high intelligence, unique physique and adorable demeanor. The German Shepherd Border Collie Mix is ideal for active families that can keep up with his workaholic nature. But before introducing this graceful dog into your home, here are a few things you should know. Where does the German Shepard Border Collie Mix come from? The last twenty years has seen the rise of the Shollie breed. But the reason as to why it was bred is yet to be established. This designer dog is a cross breed of the German Shepherd and the Border Collie. The German Shepherd is an extraordinary dog that excels both as a military and family dog. His high IQ and energetic nature make him easy to train. The dog tends to be protective of his owner. He is aloof with strangers but affectionate and friendly to familiar faces. Our four-legged friend originated from Germany. It is believed that the German Shepherd is a result of breeding the native northern and central German dogs. He was designed for the sole purpose of sheep herding. However, he proved to be a more superior dog worth of a higher ranking. During World War I and II, the German Shepherd was used as a messenger, first aid, guard, and rescue dog. He was admired by many, resulting to his later importation to the USA. Thanks to its introduction, breeders can now produce hybrids such as the Shollie by breeding the dog with other Shollie’s. The Border Collie acquires its name from its origins. Just like the German Shepherd, this dog was used as a sheepdog in the borderline of Scotland and England. This British native dog was relatively recently recognized by the American Kennel Club in 1995. The Border Collie requires excessive training due to his unending supply on adrenaline. For mental stimulation, it’s best to incorporate challenging tasks for his enjoyment. As a quick learner, our cheerful playmate easily picks up new commands. His high intelligence makes him a perfect cue reader. However, his domineering nature if not well timed may prove to be a flaw as he may try to herd other pets. Generally, both the German Shepherd and the Border Collie are exceptional dogs. When you combine their strongholds, you end up with the mighty German Shepherd Border Collie mix – a superior breed lesser the shortcomings that plague its predecessors. Similar to other designer dogs, the Shollie is yet to be officially recognized by major USA canine registry organizations. As a result, information on the dog’s temperament is not as concrete as for purebred dogs. There is no certainty which trait will be predominant in your German Shepherd Border Collie mix. Still, by taking a look at the behavioral metrics of the parent breeds, you can estimate certain traits. The Shollie carry both of his parents’ DNA. He is a high-spirited, fun-loving, industrious, intelligent and protective dog that enjoys affection from his owner. From the German Shepherd, he inherits his high IQ and protective nature. As a result, the dog tends to be very protective over their owners and aloof when strangers are around. The dog picks his playfulness and high-energy levels from his other half, Border Collie. He requires both physical and mental stimulation to keep him active. As an industrious dog, he is well adaptable for military and family life. Overall, the German Shepherd Border Collie mix is an all-rounded dog that loves to interact with kids. He is an excellent choice if you are looking for a protective dog that enjoys plenty of play time. A lot of designer dogs tend to pluck fairly equal traits from both parental breeds. However, this is not the case of the German Shepherd Border Collie mix. The hybrid dog tends to lean more on the German side of the tree. But this is not a case of one predominant gene over another but a result of the Collie gene being subtle. The German Shepherd Border Collie mix gets its heaviness from the German Shepherd side. This relatively large dog can weigh up to seventy to eighty pounds. In the case of height, males can grow as tall as twenty-nine inches while females reach a maximum of twenty-five-inch high. Generally, your four-legged friend may resemble more of the German Shepherd. At times during his puppy days, he may be mistaken for a purebred German Shepherd. Your furry friend may have less bushy tail compared to the German Shepherd dog. His coat also tends to be thicker. Both these traits are plucked from the Border Collie’s DNA. Most Shollies come with a tan colored coat with hints of black. However, you may find other cases of black, white, yellow, cream, and brown colored dogs. These dogs are good with folks that are not allergic to fur – they can shed a lot! Both the German Shepherd and the Border Collie are renowned for their work ethic. The German Shepherd Dog is famed for his work as a police, military, and guide dog while the Border Collie is an elite sheepdog. The combined intelligence of both breeds trickles down into the DNA of the Shollie. The result is a bright dog that skillfully follows direction to the letter. This makes training more pleasurable and easy. The Shollie gets his athletic streak from the Border Collie lineage. When you combine his agility, high IQ, and unending energy surge, you get a natural sports-maniac. Your dog will enjoy engaging activities like Frisbee, swimming, and your regular morning runs. When going for walks ensure your Shollie is attached to a strong leash. It is best to start training at an early age. This will lessen chances of him developing aggressive tendencies towards other pets and family members. Positive reinforcement is also recommended as part of the training as the dog can be stubborn if scolded. The German Shepherd Border Collie mix is a moderate shedder that shed twice every year. In our experience, they shed much more than this. However, they still need their daily share of brushing especially during the shedding season. Brush eliminates dirt and loose hair that build up during outdoor play. A consistent brushing regime complimented by a healthy diet will keep your dog’s coat shiny and healthy. Bathing should be moderately done, as excessive canine shampoo may rid the skin of its natural protective oils. You Shollie requires teeth brushing at least once daily. His nails may also need a bit of grooming now and then. But most importantly, don’t forget to clean your dog’s ears every week. Avoid using sharp objects that may harm his ears but instead use a soft cloth to gently wipe of dirt. The Shollie has an incredibly long lifespan of twelve to fifteen years. During his prime time, just like other dogs, expect a very energetic dog. However, as he progresses in age he will become less active. 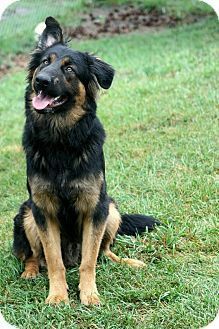 Shepherd Collie as they are also known tend to have a large appetite due to their large physique and active lifestyle. It is wise to feed you Shollie twice a day on dry dog food rich in fiber and energy. With proper diet and exercise, your German Shepherd Border Collie mix can live a maximum of twelve to fifteen years. In spite all of the positive traits, the German Shepherd Border Collie requires regular ears and eyes grooming to eliminate the chance of infection. Your beloved dog is also likely to suffer from skin problems, joint dysplasia, bloat, Wobbler Syndrome, and Von Willebrand’s disease – which affects his blood’s ability to clot. The health of a Shepherd Collie is dependent on the genetic makeup of the parent breed. If the designer dog is bred from parents with diverse gene pools, then it may have far lower chances of expressing defects associated with the parent breeds. For instants, if the Border Collie used to breed the Shepherd Collie is suffering from hip dysplasia there is a higher chance of the Shepherd Collie contracting the disease. Prospect owners are encouraged to know the health history of the Sholly’s parents for early indications of changes of a genetic disease that their dog is like to suffer. As a big energetic dog, the German Shepherd Border Collie won’t thrive in enclosed living conditions like a small apartment or flat. The dog requires enough room that can handle its playful nature– it tends to run around a lot. A large fenced garden would be ideal. Dog owners who live in apartments or lofts should refrain from adopting such an active dog. The Shollie is perfect for active families that live an active lifestyle. If you like outdoor activities, then a German Shepherd Border Collie mix makes an ideal pet choice. He will keep you motivated during those morning runs. But if you are more drawn to a dull lap kind of dog, it is best to go for a lesser active dog. Is the Shollie good with kids? The Shepherd Shollie tends to be very protective, yet affectionate. These traits make him perfect for homesteads that have kids. He makes a good play buddy as well as a defense mechanism whenever in unfamiliar grounds. This dog will keenly watch over your young one to keep him out of harm’s way. Of course, any dog will be good with kids if they’re properly socialized and trained when they’re young. We do not recommend introducing your dog to your kids without adult supervision or to dogs who are unfamiliar to you. There are a few things you must know before selecting a Shepherd Collie for your home. If you are a breeder, try choosing purebred German Shepherd and Border Collies that are healthy and disease free. If buying from a dog shelter, try to determine the history of the dog and take the introduction to other members of the family slow. Going for a puppy Shellie can be a good idea, so that you can begin its training from an early age. Remember to take your dog for regular checkups for early detection of any ailments. Are Shollies better than the parental Purebreds? Many potential dog owners often ask this question. The answer lies within what kind of trait are you looking for in a dog. Hybrid dogs are created with the notion that they will inherit good traits minus the bad genes from both purebred dogs. However, this is usually not the case. But with careful examination, you might end up with the desired hybrid dog that portrays all the traits you want. More time to bond and connect with your dog. Improve both you and the dog’s physical health. Immunity to lifestyle diseases such as diabetes, obesity and much more. Keeps the both you and the dog active and fresh. Helps with dementia in senior dogs. Help prevent aggressive tendencies due to excess tension and energy. In a nutshell, German Shepherd Border mix is an energetic dog with a high IQ. He comes from a generation of legendary workaholics that have a certain surge for life. These dogs are great with active families. Let us know if you have a Shollie, we’d be glad to hear how you’re getting on! Furbo Pet Cam Review - Is This The Ultimate Treat Dispensing Cam?